Note: There is a bug which causes Ed to disappear from the game. It's been reported that if you achieve PWWT, and then drop it down to PBWT, and then bring it back to PWWT, Ed will vanish from the game without a trace. Making it impossible to gain trophies, upgrading weapons with rare ores, and forging weapons from Demon's Souls. However, like all NPCs, he will return on your next playthrough. 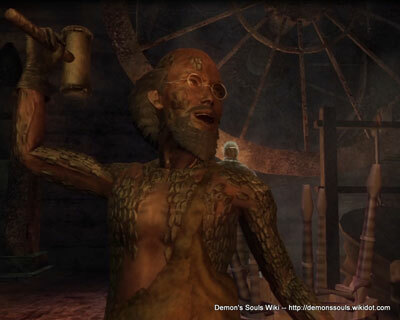 Can upgrade many weapons into unique weapons using Demon's Souls once given a Red Hot Demon's Soul from Flamelurker. Drops Hands of God if killed. Must have the Red Hot Demon's Soul in your inventory. Select the talk option with him multiple times until you have exhausted all his dialog and he just repeats himself. Must have defeated the Armor Spider and Flamelurker on current playthrough. Hm? I haven't seen you around these parts. Bah, what does it matter? You need a blacksmith, show me some coin. If not, head straight for the door. I am busy. I'm not here to chit-chat. Forging a weapon strengthens it, and alters its character. Ores are transmogrified sprites. Their presence blesses the weapon. Bah. What be your need? If it be a blacksmith, then show me some coin. If not, head straight for the door. Demon Souls? The Demons are powerful spirits; some can even bless weapons. But doing so requires a powerful flame… For the soul of a Demon is an inferno of wrath. I told you that I am busy. Each ore has a grade. Mighty weapons can only be blessed by ores of high grade. Yes, that's the one, a red-hot Demon Soul. Now you can bless your weapon with another Demon Soul. Give Red Hot Demon's Soul? Hm, a wise choice. You have done well to put your trust in the great blacksmith Ed. Bring me a Demon soul, and I shall use it to bless your weapon. Surely you jest. Why talk all that nonsense if you have no such intention. The poor lad doesn't know a good blacksmith when he sees one, and hardly deserves a Demon soul. Wait! Come back this instance! I have no business with your kind. I'm busy, begone with you! All done? Then be gone. I work alone. Bah. Don't waste my time.